The idea of making a vinyl album with King Ayisoba's best songs came in 2012 when he saw, during his tour with Zea through Europe, people buying vinyl and DJ's playing from it. "I need to make a big cassette too " is what he concluded. In Ghana the people do not play the big cassette (vinyl), nobody has the players so the old people throw away the records because they are useless. Ayisoba selected the best songs from his albums “Modern Ghanaians” (PMR 001) and “Africa” (PMR 003), which were only released in Ghana on CD and cassette and he added to this his 2012 hit single “Don't Do the Bad Thing”. The LP is titled “Modern Ghanaians” since it is, according to Ayisoba: "the best presentation of what my music and style is about." King Ayisoba is a star in Ghana. His kologo sounds melodic and percussive at the same time and with Panji Anoff, his producer, he changed the Accra music scene by using traditional instruments together with the hip life (a style that emerged in Ghana in the mid-90s and contains hip hop and dancehall elements) beats, bleeps and bass. His lyrics are very personal, sometimes funny, often urgent and always imaginative. The opening song “Modern Ghanaians” has a tumbling bass line that can excite the dance in anyone and guest artist Kweku T raps on top: "This is the present, the future and I call it my own, black Gold Coast, West Africa my home." His number one hit “I Want to see you my father” is in the hearts and minds of every Ghanaian. In the song he advises fathers to be responsible and stop spending all their money on girlfriends. It's a cry of a son who wants to see his father. A novelty appeared on the Ghana Music Awards Festival 2007 when Ayisoba, being a traditional artist, won in the category 'most popular song of the year'. Traditional music had hardly been in the mainstream of Ghanaian music but King Ayisoba changed it all. Every now end then, an exception to the rule emerges that redefines the rules of the game. King Ayisoba's debut “Modern Ghanaians” is such an album, and as the title suggests, it is a journey into the present and towards the future; and an introduction of a new era of creativity and originality in the Ghanaian music industry. His hit single “My Father” was savoured as much by the young as by the old, and by the illiterate farmer as by the business executive. He won the Ghana Music Award for Song of the Year in 2007 as well as the Traditional Song of the Year. 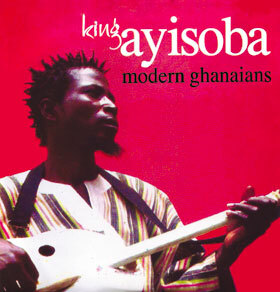 King Ayisoba's, “Modern Ghanaians” is the fastest selling cassette by an artist from the Northern part of Ghana. The albums popularity started in Bolgatanga where the artist is from, but has spread through the other regions like harmattann bushfire. Singing in English, Twi, Frafra, King Ayisoba's struck a chord with the Ghanaian audience and has embraced his 2-string traditional guitar (Kologo) with great passion.